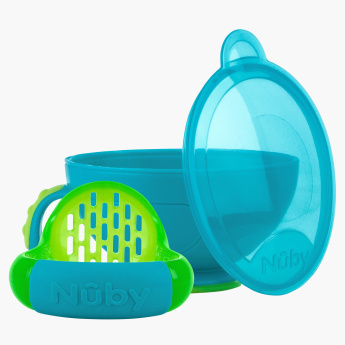 Nuby Garden Fresh Mash and Feed Container with Lid | Blue | Create fresh and healthy baby food at home. Travelling with your baby will be a cakewalk when you carry your baby’s food in this versatile container. Accompanied by a lid, this BPA-free container lets you prepare the food and also store it at the same time. Feature 1 : Create fresh and healthy baby food at home. Feature 2 : Preapare , mash and store in same container .